The 12-year-old was flown to Brisbane in a critical but stable condition after becoming the second shark attack victim in 24 hours. 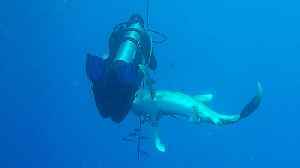 By David Aspinall A huge great white shark gave an up-close insight into what a shark attack looks like when it bit down on an underwater camera. 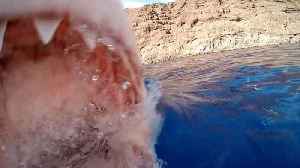 As Peter Kragh was floating in a boat off Guadalupe..
A maths professor has described her "real-life Jaws" moment when a 12ft shark sank its teeth into her companion's wrist, sending a geyser of blood exploding through the sea as he swam just feet away..